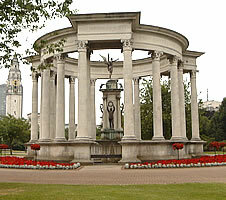 This page provides a brief introduction to Cardiff, the capital city of Wales. It includes practical information for people who want to visit the city. 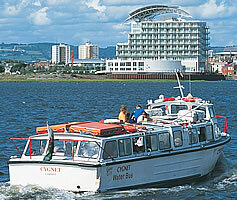 Cardiff is also an excellent base from which to explore other parts of Wales. Cardiff Castle is on the site of a Roman fort (built in around AD 75), and a Norman castle was created there about a thousand years later. It was bought by the Bute family, who were made extremely rich by owning the land on which coal was mined and exported worldwide. The rooms in the castle are beautifully decorated - in many different styles. There is an entrance charge to see the grounds or to have a guided tour of the rooms. It is worth paying for the guided tour. In the castle grounds you can climb up the watch tower (pictured), and you may be able to see peacocks and other birds in the garden. 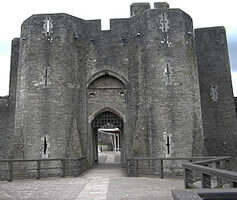 For more details, see: http://www.cardiffcastle.com. 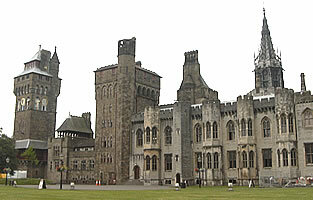 The main buildings of interest in Cardiff are located in two places: close to the castle, and in the bay area. The National Museum of Wales is an art museum. See: http://www.nmgw.ac.uk/nmgc. 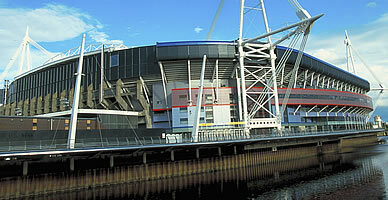 The Millennium Stadium is used for major sporting events and concerts: http://www.cardiff-stadium.co.uk. On most days it offers stadium tours. 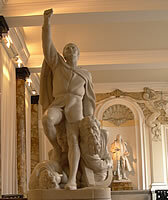 The City Hall is an impressive building - the Marble Hall on the first floor is open to the public and includes statues of Welsh heroes such as Llywelyn the Great and Llywelyn the Last. Cardiff Bay was once a busy dock through which coal was exported from South Wales mines. Part of this area is now being transformed into a centre of entertainment. There are many restaurants and bars in this area. 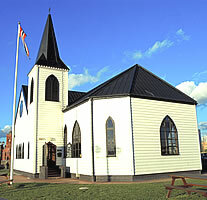 There is an arts centre and café inside the Norwegian Church (built in 1869). 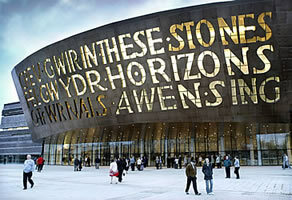 The Wales Millennium Centre opened in November 2004. It is a major cultural centre where music, theatre, opera and dance/ballet are performed. 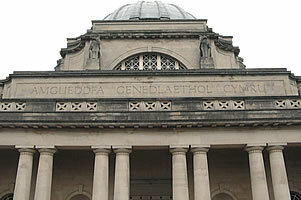 There are two short poems inscibed on the building, written by the Welsh poet Gwyneth Lewis. On the left it says "Creu gwir fel gwydr o ffwrnais awen", which is Welsh for "Creating truth like glass from inspiration's furnace". On the right it says "In these stones horizons sing". 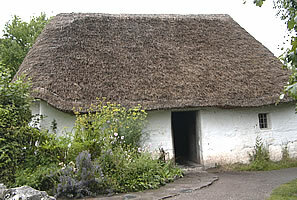 If you have at least half a day, take a bus from Cardiff bus station to the Museum of Welsh Life near St Fagans (buses are not very frequent, so it may be worth checking bus times in advance). 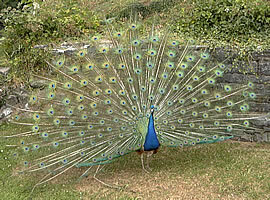 There is a large park here (100 acres, or 40 hectares) where you can enjoy the plants and wildlife. 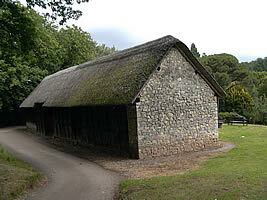 Within the park are many old buildings from throughout Wales, including a reconstruction of a Celtic village. If you visit on a weekday, you may be able to watch craftsmen working in some of these buildings. 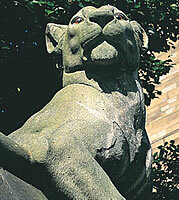 For further information and for details of opening times, see: http://www.nmgw.ac.uk/mwl. 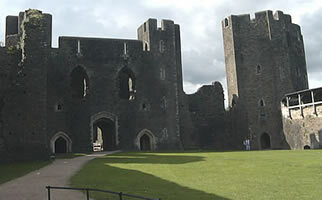 Not far from Cardiff is Caerphilly Castle: a Norman castle started in 1268 to strengthen English control over the Welsh. 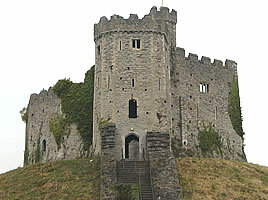 The castle was restored in the late nineteenth century. 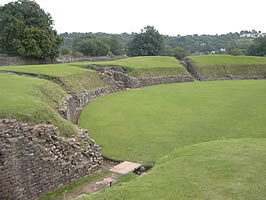 Another popular attraction not far from Cariff is Caerleon. This was the site of a Roman legionary fortress. Remains of an amphitheatre, a barracks room and sections of a wall have been excavated. The National Roman Legion Museum displays some of the Roman objects which have been found and explains the life of the legionaries. 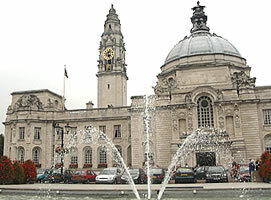 - The fastest way to travel to Cardiff is normally by train. The fastest services from London Paddington to Cardiff Central take a little more than 2 hours. For train timetables and to buy a ticket, see: Shop/Company/TheTrainline. 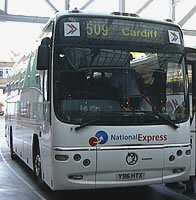 - The cheapest way to travel to Cardiff is by coach. The journey from London's Victoria Coach Station lasts about 3.5 hours. For timetables and to buy a coach ticket, see: Shop/Company/NationalExpress. There is also a limited but cheap service provided by Megabus: http://www.megabus.com. 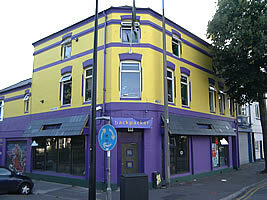 - Cheap accommodation in Cardiff includes the Cardiff Backpacker hostel (centrally located; book here) and the youth hostel (about 2 miles - 3 kilometers - from the centre of Cardiff - you will need to take a bus to get there; for details, see: here). 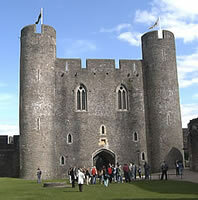 "Historically and culturally significant and now very trendy, the first city of Wales is on a high ... The superb dead-centre Millennium Stadium was created for the 1999 Rugby World Cup, and is now the venue for a full calendar of national and international fixtures ... Meanwhile, a jumping music and bar scene is the focus for a vibrant Welsh youth culture, aided and abetted by the city's 25,000 students ... At Cardiff's heart lies a marvellous mock-medieval castle and a world-class museum and art gallery"